Switzerland (German: Schweiz; French: Suisse; Italian: Svizzera; Romanch: Svizra) is an alpine country in Western Europe, famous for its numerous varieties of cheese. It was visited by Mario during the events of the Club Nintendo comic "Sag niemals Holerö!". The plumber, exhausted of laying pipes, spent his holidays in Switzerland. 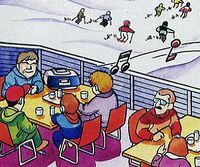 He was skiing there, when some other skiers noticed that someone was singing "Holerö." Suddenly all the Swiss turned into cheese; only Mario stayed the same. This was due to the magic potency of the word "Holerö" which, when pronounced, turned all people except Mario into a kind of food that was typical of the person's country of origin. Mario, terrified of these transformations, decided to leave Switzerland as soon as possible. At the airport, however, he found that the crew of his American airline, which was supposed to take him back to New York, had turned into hot dogs. Doubting of the hot dogs' ability to fly a plane, Mario decided to go to Austria by train instead, in order to get to Germany and to go back to New York from there. "Switzerland" is also the name for a Super Smash Bros. Melee bonus points in Classic, All-Star and Adventure modes. The bonus values for 12000 points if the player doesn't give nor recive attacks (in reference to the real country's neutral position during both World Wars and its natural peacefulness). This page was last edited on July 10, 2018, at 14:13.